Blue Quartz, also called Dumortierite or Dumortierite Quartz enhances organizational abilities, self-discipline and orderliness. Blue Quartz balances the throat chakra and enhances communication between the lower chakras (physical) and the higher chakras (mental/spiritual). It aids spiritual development and facilitates contact with spirit guides and angels. It is an excellent stone for meditation. Blue Quartz helps release fear, increases courage and enhances creativity and the ability to express oneself. It eases depression and promotes peace and happiness. 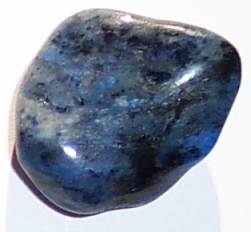 Blue Quartz is especially helpful in bringing clarity to those who are disorganised and unfocussed. It helps one to see and accept reality and to react to it in an intelligent manner. It helps reduce stubbornness and relieves emotional tension. Blue Quartz is cooling and aids detoxification and is beneficial to the throat, thyroid, parathyroid, spleen, blood and endocrine system.